Phuket, Thailand is a destination cruise ships call at but my experience was from a holiday where I stayed in a hotel for one week. The good thing is where I was staying is near to where the ships visit which is in Patong. It’s a town on the west coast of Phuket Island and features a long busy beach called Patong beach. Everyday a different cruise ship arrives and often spends an overnight at the tourist hot spot. The ships have to use tender boats to get passengers to the island. Once at Patong the cruise passengers usually spend time on the beach in the day and then enjoy the famous bars at night. 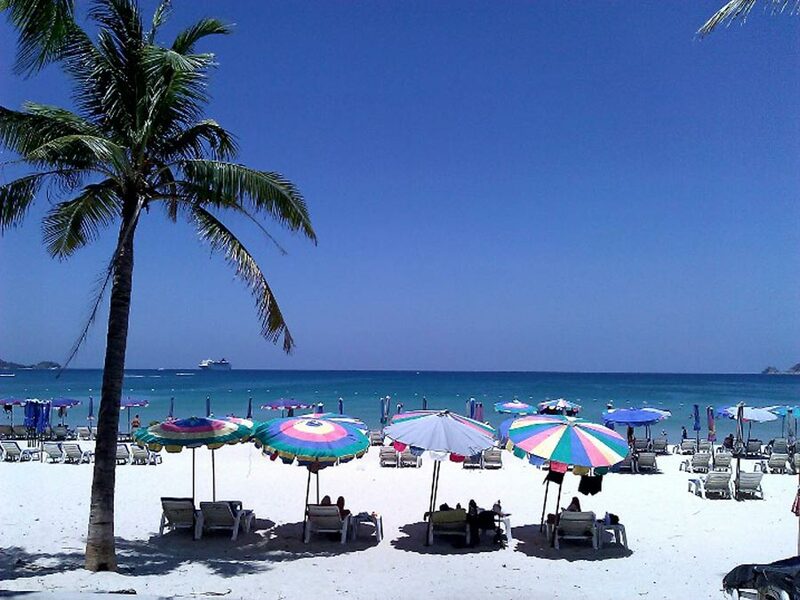 Let’s start with the Beaches, Phuket offers lots of beaches but Patong beach is by far the busiest as it has plenty of bars and restaurants to compliment it along with many hotels all along the beach front. There is another beach nearby called Karon beach which is not as busy and only a 10 minute taxi ride from Patong beach. At night people can also purchase lanterns which can be lit up and let off into the nights sky. The nightlife in Patong is electric with many bars and this is why the town is so famous. There are all sorts of bars from large bars with pole dancers to smaller sports bars. When I was there I tried larger and smaller bars and there was a big difference. When at the smaller bar it wasn’t as busy so the people working there tried harder to get my money. They succeeded by playing the “Connect 4” game with me and I lost so had to spend more money at the bar by buying two tequila shots for the girl who beat me. All the workers were doing this with everyone! What was annoying is that I was pressured to play the game and felt bad if I didn’t. Now at the larger bar there were no scams as it was just too busy but it was a good busy with a great atmosphere. There was no pressure to buy more drinks. Passengers from the ship will definitely experience this so it’s wise to remember. Dining in Patong is pretty good and if you like sea food then this is the destination for you. There are so many sea food restaurants with fresh catches right from the ocean and they are always busy. There are also other types of restaurants but not as popular from what I saw. Shopping isn’t too bad if you want souvenirs but if you’re looking for a good liquor shop or jewellery shop then it’s best to do it all on the cruise ship. There is one large supermarket but it can be busy at times and the heat is so hot it’s not worth carrying shopping bags around town no matter what time of day it is. There are no real Jewellery shops in Patong or even Phuket town so I wouldn’t bother to be honest. Only a few cheap fake ones where you will get hassled non-stop. When walking along the streets it’s easy to get hassled so beware but try not to let it bother you as most of them are harmless and spend time to look at the menus before entering the restaurants otherwise before you know it there’s no more time! There are so many along the beach front so just choose one and go for it. A detailed review of the Azamara Journey cruise ship. This is the second time visiting Hong Kong which is a separate region from mainland china. The city has its own administrative government but is still ruled from Beijing, China.